In the summer 2015, Chicago beachgoers found that several beaches changed dramatically. The size of Lake Michigan beaches tends to change over time due to change in water levels and the levels of erosion. Two years ago, a combination of high snowfall and unusual weather patterns caused the water levels to rise. Many beaches lost land to some extent or another, and Rogers Park’s Fargo Beach lost so much land that it was closed completely. As the 2017 beach season begins, not much has changed. The Chicago Park District said that its policy is to focus on reducing erosion, and that it isn’t planning to do anything beyond that in the near future. Meanwhile, the Friends of the Park advocacy organization is pushing for an ambitious plan to add more parkland along the lake shore in Edgewater and Rogers Park neighborhood, potentially adding new beaches and expanding existing ones in the process. According to the City of Chicago website, many of the city’s beaches trace their history back to first half of the 20th century, when the shore was moved east and lakefront protection measures were put in place to reduce erosion. This created new land, which was used for parks and beaches. The city and local park districts also created smaller neighborhood beaches, many of them located at the ends of streets. 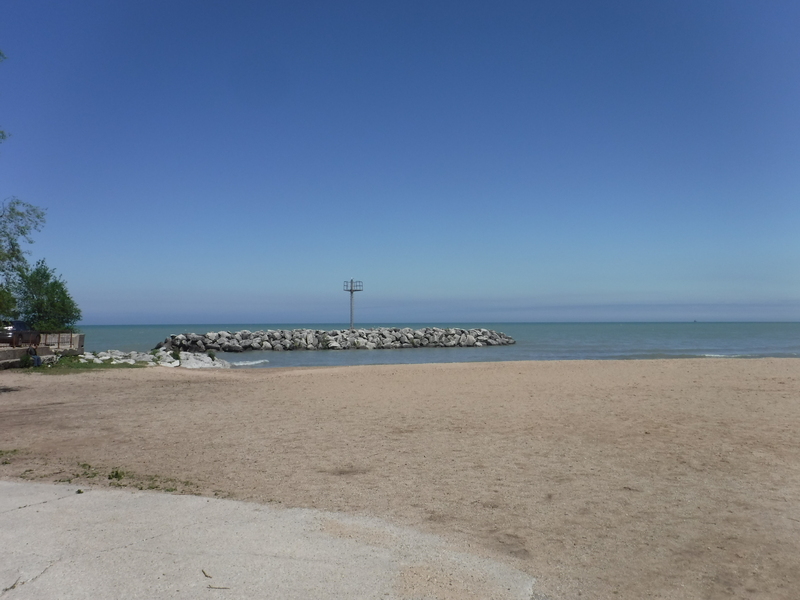 Today, most of the lakefront beaches and parks are run by the Chicago Park District. There are batches of shoreline — mostly in Rogers Park, Edgewater and South Shore neighborhoods — that belong to the owners of the nearby high-rises. Over the last few decades, water levels ebbed and flowed, and beaches changed in the process. For example, in Edgewater, what are now known as Lane Beach and Osterman Beach started out as separate beaches. The former was one of the “end of the street” neighborhood beaches that opened in the early 20th century. The latter was created in 1958 when Lincoln Park landfill was extended to Ardmore Avenue. In the 1970s, more and more sand started to accumulate by the shore, to the point that they became one continuous beach. The Lane Beach (foreground) and Osterman Beach (background) used to be one continuous beach until rising water levels in 2015 left much of the sand underwater. The water levels already rose between 2013-14. In 2015, the combination of reduced evaporation, increased precipitation and other weather conditions caused the water levels to climb. The water rose to the point where the two beaches were split again. 12th Street Beach, which is on the east side of Northerly Island, lost much of its northern portion. The dog park portion of Uptown’s Montrose Beach lost significant ground as well. But nothing has been affected quite as dramatically as Fargo Beach. 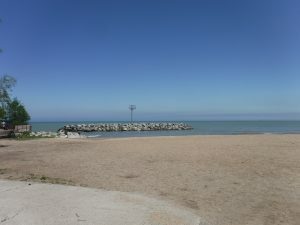 Located in Rogers Park, it was s a small neighborhood beach located at the end of Fargo Avenue. By 2014, it already lost much of its area, with the breakwater rocks that used to mark its end left an island. By 2016, the water levels got to the point where the park district wound up closing it. In August 2016, there was only a small strip of land east of Fargo Avenue — the rest was submerged completely. A more recent visit at the end of May showed that water levels haven’t dropped much. 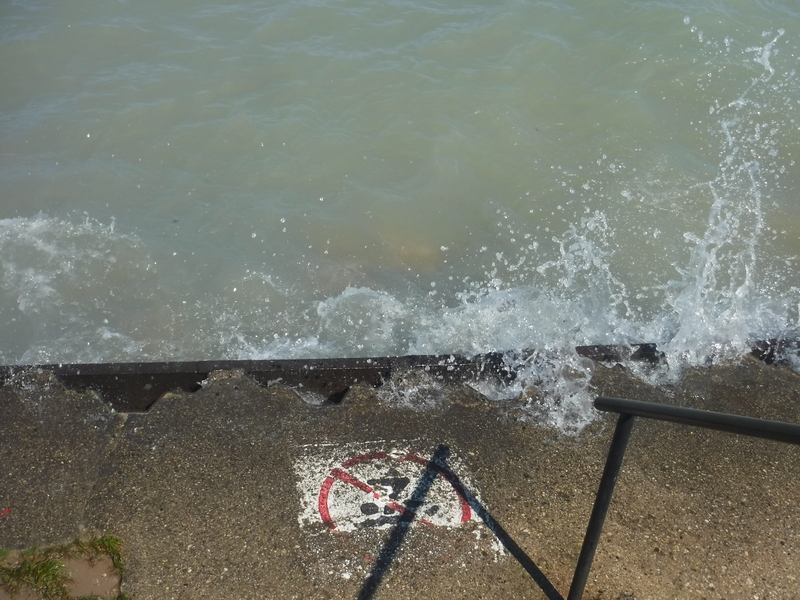 Residents are still free to sit on the stair-like stone structure that used to lead down to the beach, but there are now “no diving” signs on the edge of the water. The residents haven’t been left entirely without a beach. Griffin Beach is located only one block east, and while it lost a decent portion of the land, there is still enough left for it to remain open. And Lake Michigan isn’t looking to get any shallower. According to the U.S. Army Corps of Engineers’ May 19 water level update for the Great Lakes region, Lake Michigan’s average water level has been the same as around this time last year, five more inches than the previous month and 13 more inches than the long-term average for the month of May — though it’s still 19 inches lower than the record high set in May 1986. And the volume is only projected to increase in the near future. 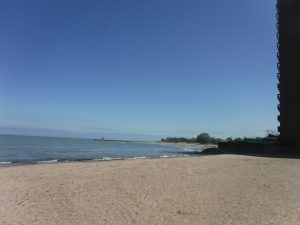 Over the next 30 days, lakes Michigan-Huron and Superior are forecast to continue their seasonal rise, climbing 2-3 inches, respectively, before June 19 June, the report stated. Jessica Maxey-Faulkner, the Chicago Park District Director of Communications, said that the agency focuses on preventing erosion. The breakwave rocks, which used to mark the end of Lane Beach, now look more like an island. The park district has been planting dune grasses and working to restore dunes at several beaches to act as natural barriers to erosion. That includes Leone Beach, the northern end of Osterman Beach and South Shore Beach. 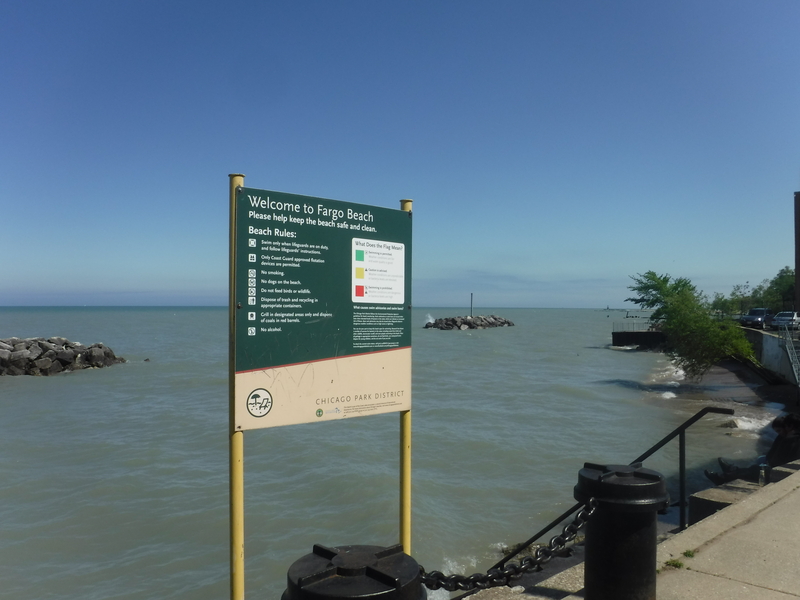 It has also been working with the City of Chicago and U.S. Army Corps of Engineers to refurbish the decades-old flood protection structures between Montrose Harbor and South Shore’s Rainbow Beach. As for the water levels, the park district views it as a natural occurrence, and it has no plans to do anything about it — at least for the time being. As for the Fargo Beach specifically, it looks like it would remain closed for the observable future. Bob Fuller, a legislative aid to Ald. Joe Moore (49th), whose ward includes the beach, echoed Maxey-Faukner’s comments about the district policy. The fate of the park, Fuller said, was part of a longer-term discussion of the lake’s future. “Our office is in conversation with the City [of Chicago], the park district, as well as state and federal agencies to plan for long-term lakefront issues affecting property, recreation, scenery and lake health,” he said. Juanita Irizarry, the executive director of the Friends of the Parks advocacy group, said that, while the lake level changes are natural, she was concerned about the lake shore’s long-term future. “With climate change, there’s reason to imagine that it will become more of a problem,” she said. To help combat that, the Friends of the Parks are backing a project to extend the landfill past Ardmore Avenue, taking it to the Chicago/Evanston border. “We would imagine [that] as lake levels rise, most of those property owners, some of who would like to be in front of lake would enjoy having it, so when lake levels rise, [water] doesn’t come up onto their properties,” Irizarry said. When asked how that would affect the beaches that are already there _ such as Loyola Beach and Fargo Beach — she said that there was no reason why the beaches couldn’t be incorporated and expanded further out. Irizarry noted that the city and the State of Illinois are currently working on a project to figure out how to address the issue of Lake Michigan water flooding certain portions of Lake Shore Drive during storms. “They are looking at different scenarios [for] how to improve Lake Shore Drive, and they are looking into building more parkland to protect Lake Shore Drive where it’s close to the lake, so it’s not unusual thing to imagine addition protection of properties,” she said. Irizarry emphasized that her organization isn’t in favor of expanding Lake Shore Drive — just that the fact that city and the state are floating the idea suggests that they recognize the value of adding more parkland.